Ah! Good old Queanbeyan, home of the Peter Morton Academy, where the stage was set, literally, for the home-town exhibition. The venue was a local trade fair in the Queanbeyan Bicentennial Hall and the demo team had centre stage, looking down on exhibitors and sightseers. The mat was all laid out, the time had come to put on the show and some of the team had not made an appearance. Then out of the crowd their images formed. One senior blue belt girl looked up at the stage and exclaimed, "We're not doing it up there are we? I can't do it up there!" She was told that the demonstration was to be done on the stage. She had, the week before, participated in a demo at the Canberra Show and was asked what was the difference. To this she replied that everyone would be able to see her. Yes, well that was the idea and people did see her at the show. She had stage fright real bad and holding her stomach she asked to be pointed in the direction of the toilets. The usual stuff got under way - warm up, punching, kicking and then breakfalls. Hang on a minute, there was someone missing. Where was the senior blue belt girl? A quick scan revealed her whereabouts. There she was, stage right, hiding in the curtains! The stage was not all that spacious and so the mat area had its limits. This meant that anything that required group movement was going to be fun. This became true when the Basic Steps was put into motion. The movements were going to and fro, side to side, looking great. Hey, where was the 6th Dan from St Eddies? The curtains at stage left had swallowed him up. The space demon had claimed a victim. A few seconds later he emerged in his correct position as the group changed direction. What a professional! 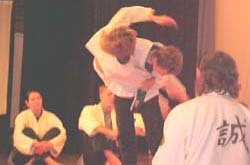 The usual oohs and aahs filled the stage as senior black belts attacked each other with knives, punches, kicks and throws, eyes were wide as the junior members showed what they could do and the audience's attention was held. What became of the stage struck blue belt? Well, after her short repose in the curtains and after the breakfalls had finished she went on to finish her part in the demo with the rest of the team. It might have been a small demonstration to a small audience but it was a success and fun to do. First we did punching and kicking. Then we did the Basic Steps. Then we did shoulder rolls and breakfalls. Eddie and Dave did the leap frog thing. Then we did two-man attack, then the knife attack on Dave. Then we bowed and went. What I liked the best: Eddie doing his breakfalls because he went really high!